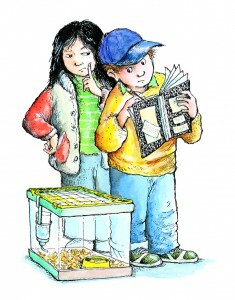 Jigsaw Jones Inspires Real Detective Agency: Inwood Kids Seek Mystery! 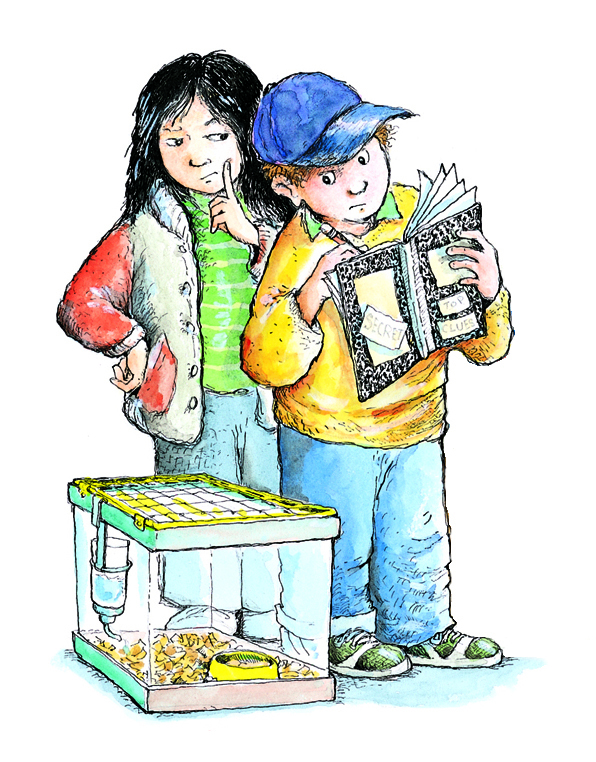 A friend alerted me to a charming article by Carolina Pichardo about two kids, a brother and sister, who were inspired by my Jigsaw Jones books to create their own business. That takes courage in today’s economic climate, particularly in NY State, which has not always been supportive of small businesses. But nonetheless! 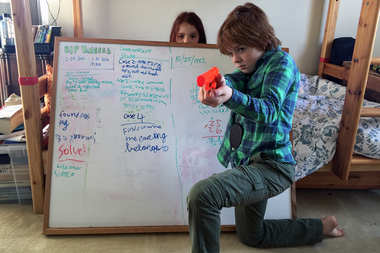 I am very impressed by Jack and Phoebe of the “Gore & Gore Detective Agency” in Inwood, NY. Here’s a link to the full article, click here. Or read below the slightly terrifying photo. I sure hope that plastic gun isn’t loaded. Siblings Jack Gore, 10, and Phoebe Gore, 7, founders of the Gore & Gore Detective Agency, already have three solved cases under their belt. They’re organized, quick and know what it takes to build a solid reputation solving mysteries. With only a few weeks in business — and using nothing more than a whiteboard, notepad, handmade fliers and a customized badge their grandfather, a retired lieutenant of the NYPD, gave them — the brother-and-sister duo have helped their neighbors find everything from a lost dog tag to an earring to a wad of cash. For Inwood resident Lisa Rainwater, a call from the pint-sized gumshoes came as a surprise, since she didn’t realize she had misplaced her dog Willoby’s name tag. It was their first case, Jack said, but it was nonetheless solved rather quickly. The kids came across the tag while walking in Inwood Hill Park, called the number listed on it and arranged to meet with Rainwater, Jack explained. Rainwater said that when she met the kids near the entrance to the park, Phoebe handed her the dog tag while Jack handed her a flier for their agency. “They were very professional,” she said. Although the kids charge $6 per case, Rainwater said they didn’t ask for money that day, since it was a case the Gore & Gore Detective Agency picked up itself. The kids’ mother, Tara Kapoor, said she enjoys seeing the passion they put into solving cases. The “training” comes in handy and keeps them alert as to what’s going on around them. “They’re pretty in tune,” she said. Kapoor said her kids’ keen sense of observation helped them solve their favorite case — when they found $820 in cash tucked inside an envelope on the ground in the lobby of their apartment building. The pair put up flier announcing they’d found the money and asking its owner to come forward. “We asked them to tell us the exact amount, what it was in [and] where they were walking,” Jack said. The real owner — a nanny who worked in their apartment building — called immediately and they were able to return the cash. The kids said they learned everything they know from reading mystery and detective books, like the “Jigsaw Jones” series and Nancy Drew novels. “I can tell if someone is telling a lie by watching their eyes,” he said. Phoebe added she has learned how to dust for fingerprints using simple tools like powder and a brush. Their mother loves how the work keeps the kids entertained and involved in their community. The Gores, however, said they realize some good cases will be hard to come by. “But we’re hoping to get calls for missing dogs or something,” Phoebe added.